The Department of Curriculum and Pedagogy is home to an outstanding group of teachers and scholars who are leaders in their respective fields of research, providing intellectual leadership through re-conceptualist, critical, and action-oriented scholarship, teaching, and community engagement, to the local, national, and international fields of curriculum and pedagogy. With an emphasis on fostering a social context in which teaching is sustainable, equitable, and given to social justice, our faculty are internationally recognized for their important work and influential research in many of the curriculum areas represented in public education as well as trans-disciplinary areas of scholarly inquiry such as curriculum theory, history of curriculum, teacher education, digital media and learning technologies, curriculum and pedagogy in higher education, and teaching and learning in informal educational settings. 2018. Rovaniemi, Finland: University of Lapland Press. 2018. In S. Pill (Ed.) Perspectives on Athlete-centered coaching (pp. 9-23) New York; Routledge. 2018. Wiley international handbook of history teaching and learning (pp. 119-148). Hoboken, NJ: Wiley-Blackwell. In I.H. Amzat, (Ed. ), Predictive models for school leadership and practices (pp. 18-42). Hershey, PA: IGI Global Publisher. 2018. In Hobbel, N., & Bales, B.L. (Eds. ), Navigating the common good in teacher education policy: Critical and international perspectives (pp. 213-224). New York: Routledge. 2018. In E. Haseby-Ludt & C. Leggo, (Eds. 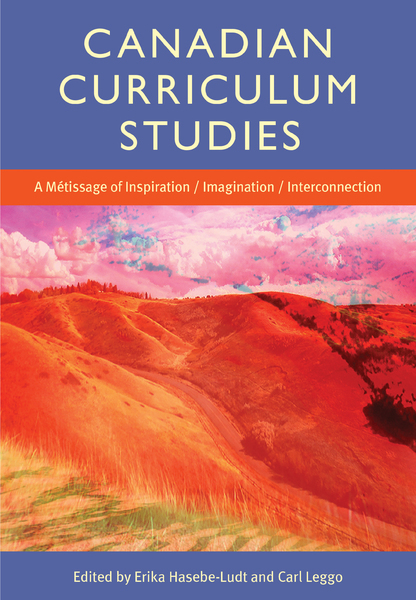 ), Canadian Curriculum Studies: A Métissage of Inspiration/ Imagination/ Interconnection (pp. 96-97). Toronto: Canadian Scholars’ Press. Authors: MacDougall, D., Irwin, R. L., Boulton, A., LeBlanc, N. & May, H.
2018. In L. Cutcher & L. Knight (Eds.). Arts-Research-Education: Connections and directions (pp. 31-60). London: Springer. Authors: Meyer, K., Nicol, C., Hassan, M., Hussein, A., Bulle, M., Hussein, Ahmed., Nashon, S., Ali, A., Olow, M. & Maalim, S.
2018. In E. Hasabe-Ludt & C. Leggo (Eds. ), Canadian Curriculum Studies: A Métissage of Inspiration/ Imagination/ Interconnection (pp. 257-265). Toronto: Canadian Scholars’ Press. 2018. In V. Freiman and J. Tassell (Eds), Creativity and Technology in Math Education, Mathematics Education in the Digital Era ., pp. 251-278, Cham, Switzerland: Springer. 2018. New York and London: Routledge. Authors: Lee, Y.-L. & Petrina, S.
2018. In N. Ng-A-Fook, S. Pratt, B. Smith, & L. Radford (Eds. ), Hacking education in a digital age: Teacher education, curriculum, and literacies (pp. 15-36). Charlotte, NC: Information Age Publishing Inc. Authors: Sant, E., Lewis, S., Delgado, S., & Ross, E. W.
2018. In D. G. Krutka, A. M. Whitlock, & M. Helmsing (Eds. ), Keywords in the social studies: Concepts and conversations (pp. 249-260). New York, NY: Peter Lang Publishing. 2018. Scholarly Research and Communication, 9(1), 1-11. 2018. Historical Studies in Education, 30(1). 2018 Historical Studies in Education, 30(2). 2018. Arbor, Special issue: Identity, Heritage and Historical Thinking. 194(788): 1-13. 2018. The Physics Teacher, 56(May), 313-316. 2018. LUMAT: International Journal on Math, Science and Technology Education 6(1): 41-59. 2018. LUMAT: International Journal on Math, Science and Technology Education 6(1): 60-86. 2018. Frontiers in Education: STEM Education, November 2. 2018. A critical reading. Health Education, 118(2), 144-158. Authors: Ralph, R. & Petrina, S.
2018. European Journal of STEM Education, 3(2b), 1-15. 2018. Policy Options. Recalibrating Canada’s Consumer Rights Regime special feature, June. policyoptions.irpp.org. 2018, International Journal for Lesson and Learning Studies, Vol. 7 Issue: 1, pp.37-49. 2017. In C. Ennis (Ed. ), The Handbook of Physical Education (pp 97-111). London: Routledge. 2017. In P. Leavy (Ed. ), Handbook of Arts Based Research (pp. 233-246). New York: Guilford Press. 2017. In S. R. Shin, (Ed. ), Convergence of Contemporary Art Education, Visual Culture, and Global Civic Engagement. (pp. 318-330). Hershey, PA: IGI Global. 2017. In P. Leavy (Ed. ), Handbook of Arts Based Research (pp. 37-53). New York: Guilford Press. 2017. In I. Levin & D. Tsybulsky (Eds. ), Digital Tools and Solutions for Inquiry-Based STEM Learning (Vol. 1, pp. 252-281). Hershey, PA: IGI Global. Authors: Cameron, E., Norman, M., & Petherick, L.
2017. In C. Ennis (Ed.) Handbook of Physical Education (pp.343-355). Routledge. 2017. In P. J. Williams & K. Stables (Eds. ), Critique in design and technology education (pp. 31-49). Dordrecht, NL: Springer. 2017. Publisher: London: Routledge Press. 2017. Publisher: Charlotte, NC: Information Age Publishing. 2017. Curator The Museum Journal, Volume 60, Issue 4, pp.505–525. 2017. Cultura_Ciencia_Deporte. DOI: 10.12800/ccd, 12(35), 87-88. 2017. Papers of the Bibliographical Society of Canada, 55(1), 51-90. 2017. BC Studies: The British Columbia Quarterly, 195(Autumn), 35-63. 2017. Acadiensis: Journal of the History of the Atlantic Region, 46(2), 59-87. 2017. Journal of Curriculum Studies, 49(5), 620-639. 2017. Historical Studies in Education, 29(2). 2017. Historical Studies in Education, 29(1). 2017. Critical Education, 8(15), 24-40. 2016. Transnational Curriculum Inquiry: The Journal of the International Association for the Advancement of Curriculum Studies, 3(1), 3–13. 2017. Complicity: An International Journal of Complexity and Education. 2017. Creative Education, 8, 1124-1134. Editors: Milner-Bolotin, M., & Johnson, S.
2017. Physics in Canada, 73(3), 121-126. Authors: Liao, T., McKenna, J., & Milner-Bolotin, M.
2017. Physics in Canada, 73(3), 127-129. Authors: Milner-Bolotin, M., & Milner, V.
2017. Physics in Canada, 73(3), 130-132. 2017. Curating as a Condition of Art Education. Visual Inquiry: Learning & Teaching Art , 6(1), 5-130. 2017. From Crit to Social Critique. In M. J. de Vries (Ed. ), International handbook of technology education (pp. 1-11). Dordrecht, NL: Springer. 2017. Asia Pacific Journal of Health, Sport and Physical Education, 8(3), 273-288. 2017. Frontiers in Education, section: Public Health Education and Promotion. Front. Educ. 2(40), 1 – 5. Authors: Alharbi, M. & Renwick, K.
2017. International Journal of Home Economics, 10(2), 109 – 120. 2016. Champaign, IL., Human Kinetics. 2016. In L. English & D. Kirschner (Eds. ), Handbook of International Research in Mathematics Education, 3rd Edition. Abingdon, UK: Taylor & Francis, 60-97. 2016. In P. Burnard, L. Mackinlay & K. Powell (Eds. ), The Routledge International Handbook of Intercultural Arts Research (pp. 454-466). London & New York: Rutledge. 2016. In J. White (Ed. ), Permission: The International Interdisciplinary Impact of Laurel Richardson’s Work (pp. 49-52). Rotterdam: Sense Publishers. Authors: Han, H. S., Zhang, J., Peikazadi, N., Shi, G., Hung, A., Doan, C. P., & Filippelli, S.
2016. In S. D’Agustino (Ed. ), Creating Teacher Immediacy in Online Learning Environments (pp. 290-306). Hershey, PA.
2016. In P. Burnard, L. Mackinlay & K. Powell (Eds. ), The Routledge International Handbook of Intercultural Arts Research (pp. 248-258). London & New York: Rutledge. 2016. In P. Burnard, L. Mackinlay & K. Powell (Eds. ), The Routledge International Handbook of Intercultural Arts Research (pp. 172-181). London & New York: Rutledge. Authors: Petherick, L. & Beausoleil, N.
2016. In D. McPhail, W. Mitchinsen, & J. Ellison (Eds. ), Obesity in Canada: Historical and Critical Perspectives (pp. 245-271). University of Toronto Press. 2016. In D. Robinson, & L. Randell (Eds. ), Social Justice in Physical Education. Critical Reflections and Pedagogies for Change (pp.183-205). Canadian Scholars Press. Authors: Norman, M., & Petherick, L.
2016. In E. Cameron & C. Russell (Eds. ), The Fat Pedagogy Reader. Challenging Weight-based oppression in Education (pp.91-100). Peter Lang Publishers. Authors: Petherick, L., Norman, M., & Rail, G.
2016. In S. Dagkas and L. Burrows, (Eds. ), Families, Young People, Physical Activity and Health, (pp. 96-113). Routledge. 2016. In W. Journell (Ed. ), Reassessing the social studies curriculum: Promoting critical civic engagement in a politically polarized, post-9/11 world (pp. 69-82). Lanham, MD: Rowman & Littlefield. 2016. In J. L. DeVitis (Ed. ), Popular educational classics: A reader. New York: Peter Lang. Authors: Ho, S., Atencio, M., Tan, Y. S. M., & Chew, T. C.
2016. In B. Humberstone, H. Prince & K. Henderson (Eds. ), Routledge international handbook of outdoor studies (pp. 277-287). Milton Park, Abingdon, Oxon: Routledge. Historical Studies in Education, 28(2). 2016. Historical Studies in Education, 28(1). 2016. Transnational Curriculum Inquiry: The Journal of the International Association for the Advancement of Curriculum Studies, 13(1), 3-13. Investigating the effect of question-driven pedagogy on the development of physics teacher-candidates’ Pedagogical Content Knowledge. Authors: Milner-Bolotin, M., Egersdorfer, D., & Vinayagam, M.
2016. Physics Review Special Topics – Physics Education Research, 12, 020128-020121-020128-020116. Authors: Chachashvili-Bolotin, S., Milner-Bolotin, M. & Lisitssa, S.
2016. International Journal of Science Education, 38(2), 25. Cross-cultural School Based Encounters as Health Education. Authors: Bruselius-Jensen, M., Kerry Renwick, & Aagaard-Hansen, J. 2016. Health Education Journal, 1, 1-13. DOI: 10.1177/0017896916676209. 2016. Victorian Journal of Home Economics, 55(1), 2-6. Students in revolt: The pedagogical potential of student collective action in the age of the corporate university. 2016. Knowledge Cultures, 4(6): 141-158. 2016. Scandinavian Journal of Educational Research , Volume 60, Issue 2, pages 127-146. Authors: Clark, P., Lévesque, S., & Sandwell, R.
2015. In E. Erdmann & W. Hasberg (Eds. ), History teacher education: Global interrelations, 191-211. History education international series. Schwalbach/Ts, Germany: Wochenschau Verlag. 2015. In D. Long & O. P. Dickason (Ed. ), Visions of the heart: Issues involving Aboriginal Peoples in Canada (4th Edition) (pp. 1–22). Toronto, ON: Oxford University Press. In(di)genuity in Design and Technology Education: Animating an ecological cross-cultural conversation. 2015. In K. Stables & S. Keirl (Eds. ), Environment, ethics and cultures: Design and Technology Education’s contribution to sustainable global futures (pp. 67-85). Rotterdam, NL: Sense Publishers. 2015. In U. Gellert, J. Gimenez Rodriguez, C. Hahn & S. Kafoussi, S. (Eds. ), Educational paths to mathematics: A C.I.E.A.E.M. Sourcebook. Berlin: Springer, 205-217. 2015. In Stephanie Chitpin, Colin W. Evers (Eds. ), Decision Making in Educational Leadership: Principles, Policies, and Practices (pp. 110-128). New York: Routledge. 2015. In Renee T Clift, John Loughran, Geoffrey E Mills, Cheryl J Craig (Eds. ), Inside the Role of Dean: International perspectives on leading in higher education (pp. 81-96). New York: Routledge. 2015. In M. J. Spector (Ed. ), The SAGE Encyclopedia of Educational Technology (Vol. 2, pp. 826-830). Thousand Oaks, CA: SAGE Publications. 2015. In X. Ge, D. Ifenthaler & J. M. Spector (Eds. ), Emerging technologies for STEAM education (pp. 135-153). Switzerland: Springer International Publishing. 2015. In M. Fleming, L. Bresler and J. O’Toole (Eds. ), The Routledge International Handbook of the Arts and Education (pp. 345-358). London: Routledge. 2015. Kingston, NY: Educator’s International Press. 2015. New York: Palgrave Macmillan. 2015. In S. Totten (Ed.) The importance of teaching social issues: Our pedagogical creeds. New York: Routledge. 2015. In P. R. Carr & B. J. Porfilio (Eds. ), The phenomenon of Obama and the agenda for education: Can hope (still) audaciously trump neoliberalism? (2nd Ed., pp. 249-276). Information Age Press. 2015. The Japanese Journal of Psychonomic Science, Vol 33(2), 1-9. 2015. Revue Internationale d’Éducation, 69: 123-133. 2015. Music Education Research, 17(4), 397-420. Adolescent love and relationships: A songwriting teacher’s autoethnography. 2015. Journal of Artistic & Creative Education. 9(1), 68-98. Teaching Visual Learning through Virtual World Experiences: Why Do We Need a Virtual World for Art Education? 2015. Art Education. 68(6). 22-27. 2015. Studies in Art Education, 56(3), 257-267. The scholarship of educational leadership in research-intensive university contexts: Institutional implications for promotion and tenure supervision. Authors: Hubball, H.T., Clarke, A., Chng Huang Hoon, & Grimmett, P.
2015. Asian Journal of the Scholarship of Teaching and Learning, 5(2). Authors: Hubball, H. T., Clarke, A., Webb, A., & Johnson, B. 2015. International Journal for University Teaching and Faculty Development, 4(4). 2015. The Canadian Journal of Action Research, 16(2)), 22-41. 2015. Physics in Canada, 71(2), 94-97. Authors: Fu, G. & Nashon, S. M.
2015. International Journal of Secondary Education, 2(6), 94 – 101. 2015. Journal of Technology & Socio-Economic Development, Vol. 4, 32 – 38. 2015. Studies in Art Education, 56(2), 103-113. 2015. Qualitative Inquiry, 21(6), 520-528. 2015. Journal Workplace: A Journal for Academic Labor, 24, 58-69. 2015. International Journal of Home Economics (IJHE) 8 (2), 19 – 35. 2015. Revista Latinoamericana de Estudios Educativos, 10(1), 19-48. 2015. Alternate Routes: A Journal of Critical Social Research, 26, 405-422.